What Makes Miley Cyrus And Liam Hemsworth Such A Compelling Hollywood Love Story? 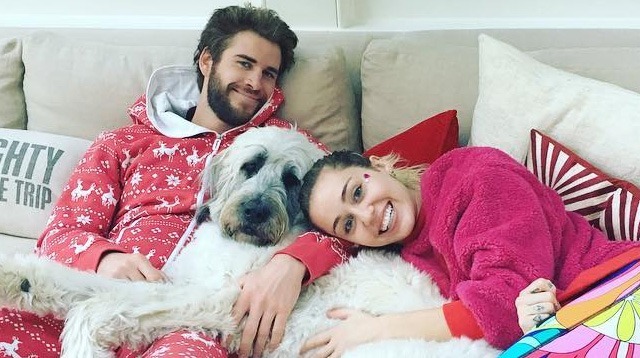 I spent a lot of time thinking about Miley Cyrus and Liam Hemsworth this holiday. I also spend a lot of time thinking about Donald Trump and nuclear war, so spare me your sanctimonious tweet about how there are more important things going on in the world. I know that. This is a blog post about Miley and Liam. Their dogs and their onesies. The fact that, unlike the majority of celebrity couples who wished you a Happy New Year on Instagram, this famous couple doesn’t seem staged. What do you think they talk about when they’re high? Do they listen to The Flaming Lips? Or watch The Hunger Games? Opposites attract? Or are they more alike than we’ll ever know? Hollywood relationships are often manufactured. It’s always been that way but we talk about it more now. Perhaps because social media provides us a platform to do so, perhaps because social media has conditioned us to question the veracity of everything we see online in the first place. Who among us didn’t delight in calling Taylor Swift’s bluff when she was “caught” kissing Tom Hiddleston in Rhode Island? We brag about our ability to spot a fake couple as if it makes us too savvy and sophisticated to be fooled by the celebrity machine—when in reality we’re just playing into it either way. Maybe Taylor meant for us to believe Hiddleswift was real and in that sense her stunt backfired—but the news trended, didn’t it? You want to hear the song about it, don’t you? If you really believe Taylor is calculated enough to fabricate a romance for business, then it follows she succeeded. What do any of us get from believing a celebrity couple is fake besides a false sense of intellectual superiority and a sad dose of cynicism? What if instead of calling out bogus relationships, we do a better job of celebrating the ones that don't make us feel like love is a for-profit venture? In praise of Miley and Liam. It won’t be easy. As of this writing, the thought has crossed my mind more than once that even Miley and Liam are, in fact, a staged couple. It’s a long game that started with The Last Song (2010). She benefits from his clean-cut, “stable” image. He benefits from her wild, “free-spirited” image. They make a ton of money. I write a blog post. We're all fools. Stop. You can't overthink it like that. Who do you think picked out Liam's gold pants?